Juggalo | Brad OH Inc.
‘Tradition’ is not likely a word commonly associated with Juggalos, yet when it comes to that odd and often maligned little subculture, there does exist a unique sense of custom, ceremony, and certain things which might even be considered sacred. This past Tuesday, Oct. 31st, Juggalos from around the world gathered at the Russell Industrial Center in Detroit, MI, for a double dose of Dark Carnival sacrament, coming in the form of the 24th annual Hallowicked Clown Show. Hallowicked—the annual Halloween-night concert put on by the Insane Clown Posse—is one of the longest running traditions among the Juggalos. Halloween has always been the most beloved holiday in the Juggalo world; it’s reliance on masks and face paint fits right in with the whole clown thing, after all. It’s a night about self-expression and freedom, which are some of the most crucial ideas behind the Juggalo culture. That’s why the night has been celebrated with the annual Hallowicked Clown Show since 1994. This year however, Juggalos gathered anticipating even more than the yearly celebration and family reunion. At this year’s Hallowicked, ICP will be unveiling the 4th Joker’s Card of the Second Deck. Admittedly, that does warrant a bit of explaining. The Joker’s Cards are the central albums of ICP’s mythology—each one expanding on the key themes of the culture while providing enough shocks, laughs, and groans to keep the masses content until the next release. The albums—each a fairly simplistic face on a (usually) black background—fast become icons of the Juggalo community. While the original set was capped at 6 cards (7 albums), ICP began a second deck of Joker’s Cards with 2009’s phenomenal ‘Bang Pow Boom’. Since then, they have released ‘The Mighty Death Pop’ (2012), and ‘The Missing Link’ (2015), among other non-Joker’s Card releases. The Joker’s Cards simple symbolism makes them easy rallying banners for the uninhibited passion of the Juggalos, and their more often than not highly theatrical unveilings rank among the most anxiously anticipated events short of their actual release. The faces and names of future Joker’s Cards have been revealed by phone numbers obtained by solving riddles on side-project Eps, hidden in the liner notes of other albums, and other such creative methods. More recently however, the custom has shifted towards huge public unveilings. At Hallowickeds, Gatherings, and other such events past, ICP unfurl giant banners revealing the names and faces of their next project, and enthusiastic chants ensue. This is the sort of event Juggalos will travel for. Sure, they’ll travel just to see the band, or to hang out with other Juggalos, or to buy Faygo—but the unveiling of a Joker’s Card—that’s something truly special! Which brings us back to the matter at hand. 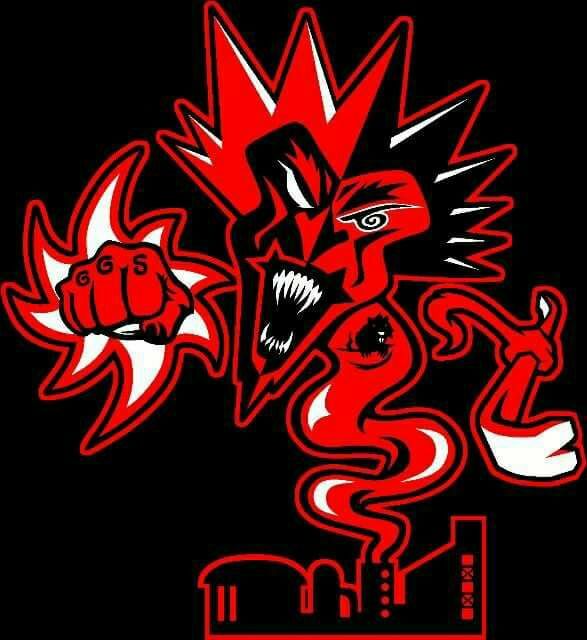 At Hallowicked this year, ICP promised to share the face of the fourth Joker’s Card of the second deck, just as they did for ‘The Mighty Death Pop’ (Revealed at Hallowicked 2010), and ‘The Missing Link’ (Revealed at Hallowicked 2014). The combination of the annual Hallowicked Clown Show, and the revealing of a new Joker’s Card makes this a truly thrilling event for Juggalos worldwide. And so, they gathered; with painted faces and countless variations of clown-themed t-shirts. With lines forming at the crack of dawn, the Juggalos descended en masse upon the Russell Industrial Center in Detroit, MI. Naturally, this was an all-day event—with myriad musical acts, wrestling matches, exhibits, and countless other attractions throughout the day. Of course, it was to be capped off at the end by the main event—the Insane Clown Posse. So when the time came, the eager Juggalos packed together tightly, and waited. Then, they waited some more. But the stage time came and went. So did midnight. Not until nearly 1:00am local time, with Halloween technically behind them, did the ICP take the stage and the epitome of Hallowicked begin. As soon as they appeared, the wait seemed of little concern to the frantic Juggalos. The Clowns rocked the audience with live standards such as ‘Hokus Pokus’, and ‘Chicken Huntin’, while adding in some scary surprises befitting the occasion, covering rare Halloween singles such as ‘Halloween on Military Street’, and ‘Sleepwalker’. As the intro to 2015’s ‘Falling Apart’ teased in the background, Violent J took centre stage to proselytize that while Juggalos are usually weirdos and outcasts, on Halloween it’s cool to be scary. Its our night! Late in the show, ICP broke into the old family favourite, ‘Dead Body Man’, bringing the congregation to a fever pitch. A cryptic chanting oozed from the speakers, and the first banner fell, bearing the name, ‘Fearless Fred Fury’. The next banner held the face. Juggalos roared their excitement for this new chapter of Dark Carnival lore. The beat for ‘Real Underground Baby’ began—a rare song live, this closed the gruesome 2004 album, ‘The Wraith: Hell’s Pit’. This choice of closer may prove meaningful, as both the name and face of this new Joker’s Card forebode wicked times ahead. ‘Real Underground Baby’ continued as the party raged, with confetti, smoke, and eventually a full blown Faygo Armageddon—a storming of the stage and massive Faygo war which has become the traditional ending to any ICP event. As the music faded away and the final Faygo flew, the crowds began to dwindle at last. Halloween was long over, but the feeling of Hallowicked still held strong as soaking and exhausted Juggalos filed out, dancing between chants of ‘Family’ and ‘ICP’, with grateful smiles beneath the smeared remains of their clown paint. Long before they are sung. Just who is the fool? Or tell you to fight. Where we’re to go now. Not to waste your time. When it’s time to console. Do not paint their faces. This poem was inspired by the recent ‘Time’ Article by Violent J, which you can read here (Link).